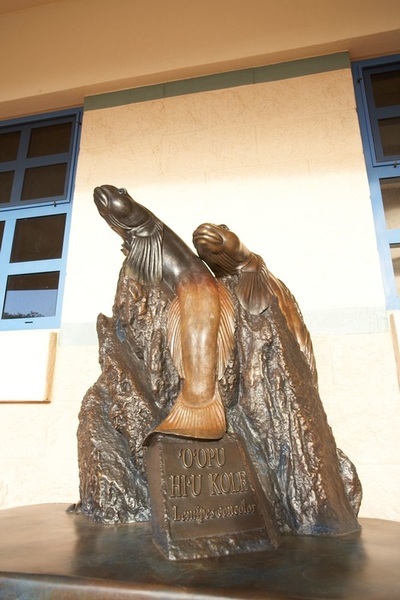 On November 2, 2011, Kapolei High School, the State Foundation on Culture and the Arts, Mālama Learning Center, and artist Kazu Kauinana held a dedication ceremony for the 'O'opu Hi'u Kole project. It was a beautiful ceremony led by students at Kapolei High School who also performed music and hula. Click on the links to see the program and watch a video showing highlights from the dedication ceremony. 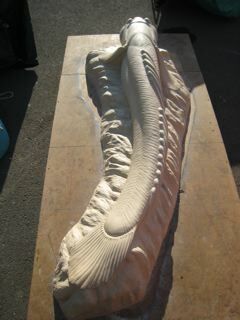 The sculpting process took many months and was very labor intensive. Kauinana created three designs of the fish: an adult male, adult female, and male juvenile. Each had its own characteristics. Rubber molds were made and then casted with concrete. The concrete-filled molds being very heavy, Kauinana devised a system to manually to flip the molds after the concrete had dried. 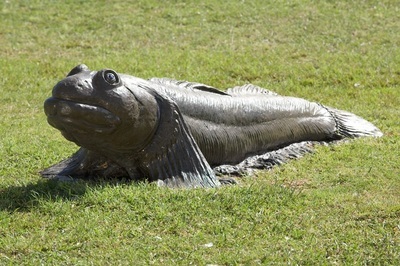 With some touch ups and a coating of protective paint, each sculpture was then carefully "planted" on campus. 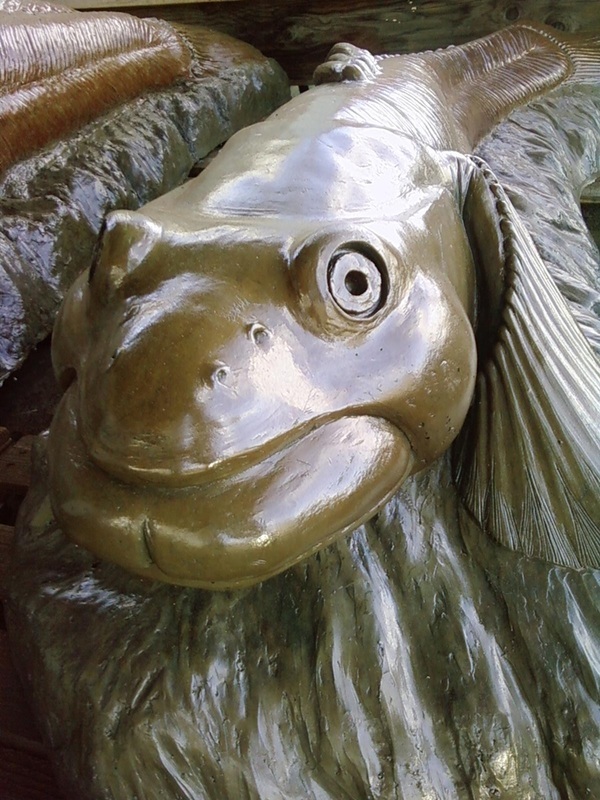 The fish were placed facing the direction of the library, where the bronze sculpture of three 'o'opu climbing a waterfall are depicted. Here are photos of the process in action. 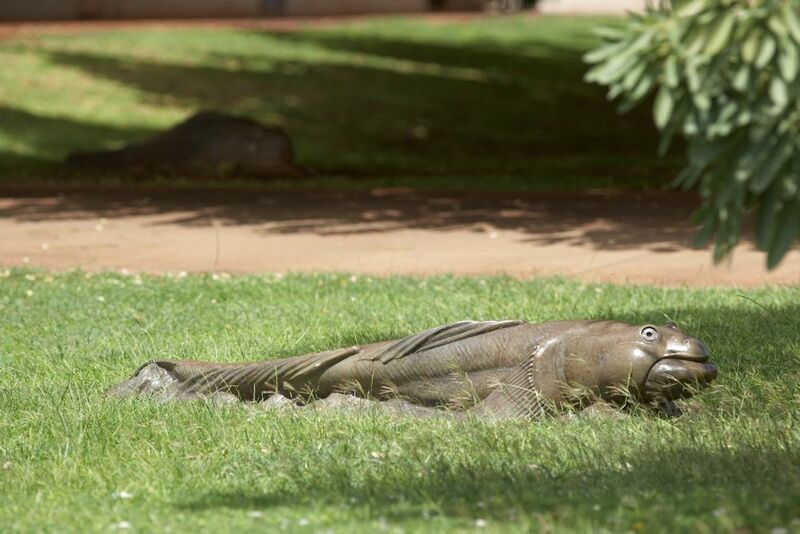 Mālama Learning Center has been a proud supporter of the ‘O‘opu hi‘u kole project at Kapolei High School since the concept to produce the artwork was initiated several years ago. As part of the Art in Public Places - Artists in Residence Program (APP-AIR), the ‘O‘opu hi‘u kole project was guided by Jon Johnson of the Hawai‘i State Foundation on Culture and the Arts (HFSCA), Kapolei High School's past and current principals (Al Nagasako and Elden Esmeralda, respectively), and artist Kazu Kauinana. 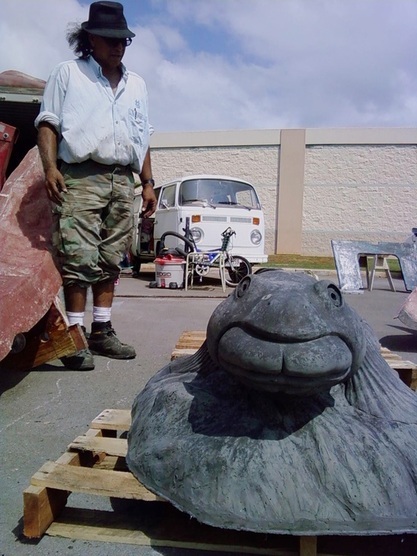 Kazu Kauinana, a native Hawaiian artist, was born in 1947 and raised in Kaimuki. 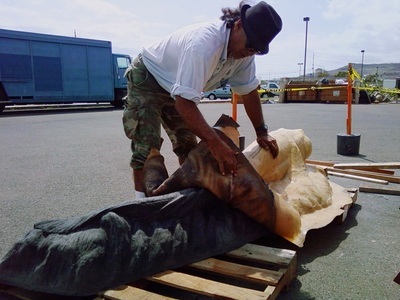 He received a Bachelor of Fine Arts degree from the University of Hawai‘i at Manoa and a Master of Fine Arts degree from the University of Colorado in Boulder. He traveled and worked extensively abroad and returned home in 1991. Kauinana was inspired by the ‘o‘opu hi‘u kole (scientific name: Lentipes concolor) as the subject for his artwork because the endemic fish possesses many character traits, such as adaptability and determination that parallel qualities students must have to achieve and succeed in their education. Hear Kazu tell his story by watching this video. The endemic ‘o‘opu hi‘u kole is unique, evolved, adaptable, and tenacious. These are the same qualities we hope to instill in our students. The ‘o‘opu hatchlings are swept down from their mountain top pools to the ocean shore. They live in salt water until they are strong enough to make the difficult climb along streams and waterfalls back to their fresh water mountain habitat. 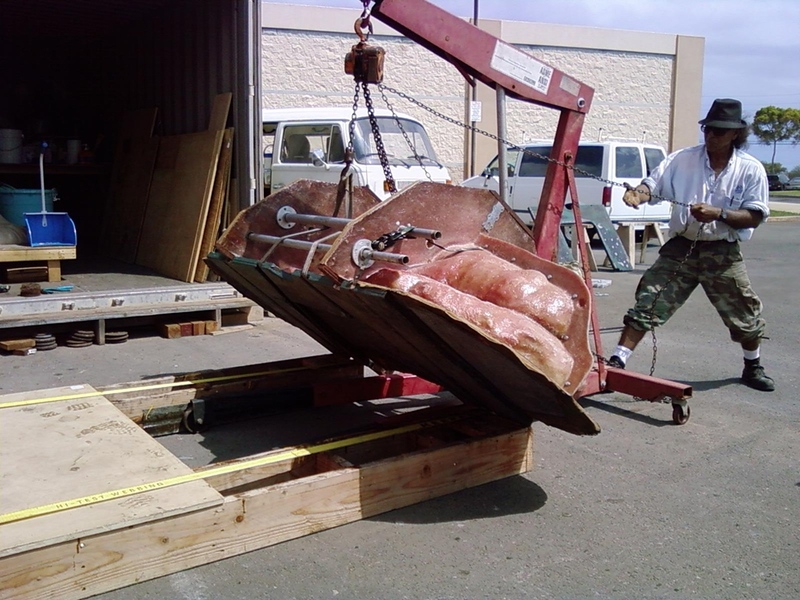 The ‘o‘opu on Kapolei High School's campus are making their way to the library, the symbol of knowledge and the pinnacle of their journey. APP-AIR is a collaborative program between the Department of Education and the Hawai'i State Foundation on Culture and the Arts (HSFCA). The program was established in 1996 to implement an integrated visual arts in education program while providing commissioned works of art in public schools. The school APP-AIR project committee is guided by the HSFCA through the process of selecting an appropriate site and style of artwork for their school campus. Artists appropriate to the project are recommended from the HSFCA visual artist registry. The school works collaboratively with the selected artist on the concept of the artwork for their school. The APP-AIR program includes an educational component designed to include student and teacher participation in the conceptualization, design, construction, and installation of the commissioned work of art at the school. The final work of art reflects and is appropriate to the school's environment, curriculum, cultural values, and aesthetics. See OHA article on this project.